Marzipans get a nutty makeover at La Patisserie! It’s New Year and the celebrations continue at your favourite Cake Shop & Delicatessen at Taj Coromandel - La Patisserie. Pastry Chef Ravi Varma and his team presents the classic Marzipans with a little twist! Instead of the usual almond meal, chefs have given this sweet wonder some nutty friends – like hazelnuts, Pecan nuts, walnuts, pistachio and cashew nuts. And it’s all homemade! 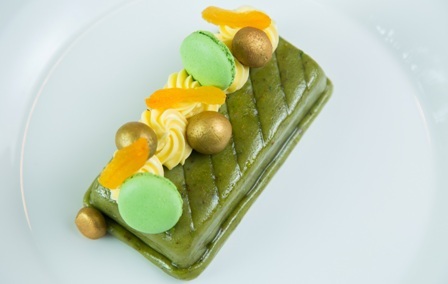 Enjoy a slice of the rich Hazelnut Marzipan and blue berry flan (Hazelnut marzipan cake topped with blue berry); or the Pistachio marzipan cake with French Butter cream (Pistachio marzipan sponge layered with French butter cream). For those who love cashewnuts, go for the Cashew Marzipan and mint Torte(Cashew nut marzipan sponge layered with mint cream). There is also the fluffy Banana cake with walnut marzipan. Chocolate lovers can try the gluten free Almond Marzipan and gooey chocolate cake (Flourless chocolate cake covered with marzipan). Yet another interesting ingredient is carrots – yes, don’t miss the Glazed marzipan coated carrot cake (Carrot cake covered with marzipan and flashed with flame to caramelize the covering)! It’s sweet bliss with delicious cakes like Strawberry Frazier (Fresh cream strawberry cake covered with marzipan); Battenberg Cake (British Tea time cake layered with jam and covered with Marzipan); and the much-loved Pecan Marzipan Meringue Cake (Pecan marzipan sponge layered with mascarpone cheese and topped with meringue).